Badging made easy with your Mobile Device! ShowMYBadge is the secure and convenient system for issuing, managing and displaying state required licenses and credentials from any device. ShowMYBadge serves all four parts of the licensing process. 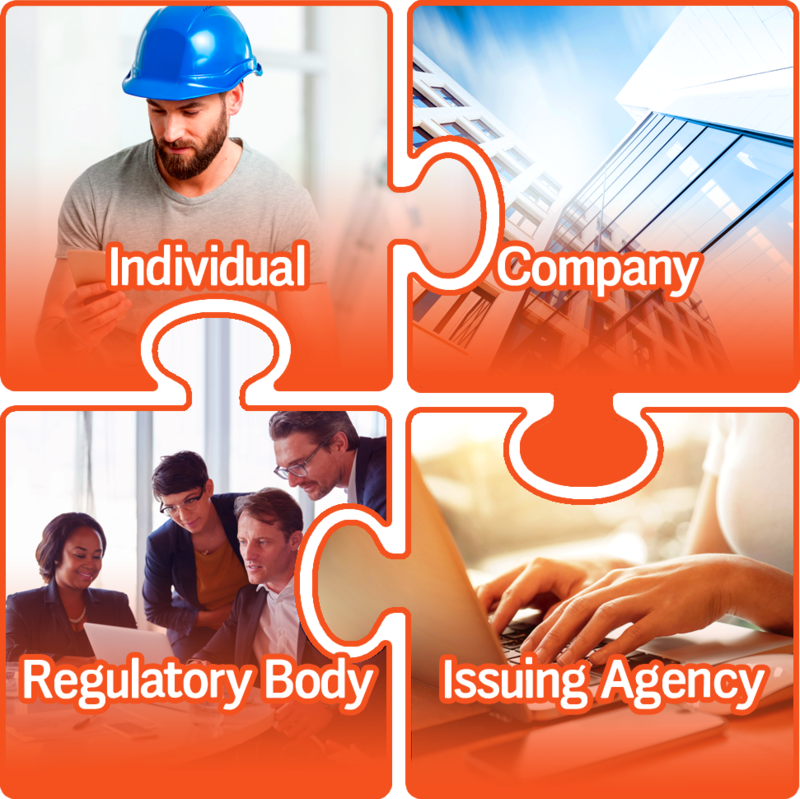 Regulatory bodies are assured of secure compliance. Issuing agencies eliminate costly distribution of printed credentials while gaining a manageable database of all users. Companies and qualifying agents are assured of compliance with full management and tracking of all employees while eliminating costly and time consuming logistics. And individuals no longer worry about losing or forgetting credentials as they are accessible from any mobile device, tablet or desktop. Click on the puzzle pieces to learn more about us. Log in to see your account information in this space. ShowMYBadge approved for BASA/FASA in Florida! ShowMYBadge is approved for BASA and FASA badging in the State of Florida. Florida now accepts electronic badging for all burglar and fire alarm technicians. ShowMYBadge currently offers credentials through approved providers of BASA and FASA badges throughout the state. Scroll down to see available options. Just a few of our features. Access your badge from any phone, tablet or desktop with an active connection. Track, manage and stay in compliance! Eliminate costly logistics and maximize value! Bring value and compliance to licensing requirements! The Alarm Association of Florida will issue a BASA/FASA badge to anyone who has taken and passed a training course from a state approved provider. The Alarm Association of Florida will issue a FASA only badge to anyone who has taken and passed a training course from a state approved provider. The Alarm Association of Florida will issue a BASA only badge to anyone who has taken and passed training coursefrom a state approved provider. Please add your profile data below. Please click the SAVE MY INFORMATION button at the bottom when you're done. Please click below to save! Click to add a photo. When you see your photo, click the UPLOAD arrow to apply. Please update your photo by clicking the photo space above. This will be used to provide you with a showmybadge.com ID credential, upon ordering one. Then, don't forget to click the "Save My Information" button below after filling out the form. You may request information on a company account using the form below. There is NO OBLIGATION associated with this submission. A validation specialist will work with the PRIMARY CONTACT listed to validate the profile and provide options and pricing. Please add your profile data below and click the SEND MY REQUEST button at the bottom when you're done. You must have at least one license holder in order to register for a company account. ShowMYBadge administrators will use this information to validate the profile before it can be activated. In this form, enter your primary license holder. You may also list a secondary license holder. If your company has more than two license holders, you will able to load them after the profile is activated. You may change your profile data below. Please click the SAVE MY INFORMATION button at the bottom when you're done. Badges are both a legal necessity and a hassle. They are yet another thing that you have to remember to have on you at all job sites. If they are misplaced, it can be weeks before a new badge can be ordered and shipped. ShowMyBadge is the simple solution that eliminates all of these issues. Now you can bring up your badge on any mobile device that has an active connection to the Internet. If you don’t have your phone, you can simply borrow one from a co-worker and instantly access your state-approved license. With ShowMyBadge, the process is easy and reliable. Simply order your badge and fill in a form right from your phone or tablet device. Create An Account: Go to ShowMyBadge.com from your mobile, tablet or desktop and set up an account. Upload Your Photo: No longer do you have to print out or scan a photo for your badge. Simply take a quality photo with your phone and instantly apply it to your profile. Order Your Badge: Place the order for your badge from the easy to use shopping cart. If you are part of a company, the badges may already be in your profile. Launch and Complete: Launch your badge and fill in some simple information and your badge is ready for approval. Badges are approved by your issuing agency within one business day. You must be on file with them as having finished the required training for state licensing. Your badge will display as ‘Not Active’ until your status is confirmed. Once approved, your activated badge is instantly available on any mobile, tablet or desktop. ShowMyBadge is currently offering the first electronic BASA and FASA badging for license holders in the State of Florida. This not only offers convenience and reliability for the people in the field, it also offers companies of all sizes the ability to maintain compliance, manage users and avoid costly fines and liabilities in one simple to use solution. Why get a company account on ShowMyBadge? With your organization’s information approved in the system, your employees will receive quicker approval and activation of their badges and avoid unnecessary and costly delays. Printed badges require a lot of costly and unnecessary administration. Photos must be gathered. Forms must be filled out and submitted. Badges must be accounted for and distributed and are frequently lost or simply forgotten. ShowMyBadge eliminates all of these concerns in one convenient and simple solution. When qualifying agents change it is a liability for both the company and the agent. All printed badges must be changed and the agent who is departing is liable for badges still bearing his/her name. ShowMyBadge instantly changes the qualifying agent on all badges electronically. This avoids the time and expense of reissuing badges to all of your employees and ensures the proper names are listed on official badges when work is done and inspectors arrive. What happens when a rogue employee is fired and they are in possession of a credential with your company’s name and qualifying agent on it? ShowMyBadge allows you to instantly deactivate a badge without the stress and hassle of having to retrieve a physical badge. All users must use your company’s email system ensuring that they do not apply for badges with personal email accounts over which you have no control. You are provided a full accounting system where you can sort by expiration dates and track users who need to renew their license(s). With this system, you have a full accounting of all of your employees who are licensed and can export the data for use in external systems. With ShowMyBadge, you will never again worry about the state of your employees’ licensing again! If you would like information on obtaining a company account, email sales@showmybadge.com for information on pricing and deployment. Are you part of a regulatory body that requires different trades to obtain and carry licenses in the marketplace? These licenses are often a legal requirement that serves a valuable purpose, but can also be a logistical hassle and costly endeavor for those who must obtain and carry them. Printed licenses are often misplaced, forgotten or simply lost. Reissuing licenses results in costly delays and expense as new forms are submitted and replacements are sent out. With ShowMyBadge, there is now a way to not only embrace but actually extend the regulatory standard while minimizing the impact on commerce in the marketplace. The Electrical Contractors Licensing Board in the State of Florida has already approved electronic badging for burglar and fire alarm installers. ShowMyBadge is the first to provide this secure service to the thousands of people working in this industry across the state. We provide a centralized system for approved providers of state licenses to issue and maintain badges that can be displayed on mobile and tablet devices with all of the verification requirements of a printed credential. When third parties are given the authorization to issue credentials, ShowMyBadge provides for real time activation, deactivation and maintenance of all badges in the field. Invalid badges are immediately pulled from circulation in real time and fraudulent badges are a thing of the past. The individuals in the field no longer have to worry about forgetting or losing their credentials. Any mobile device with a network connection can call up an authorized badge with animated watermarks, approved photos and a validated status. All legally authorized inspectors are provided with an authorization account at no charge. From a simple to use interface, they can call up any badge in the system and validate a person’s identity and status. This provides an extra level of security and validation that printed badges simply do not offer. If you are a regulatory body or an inspector of an agency that is already using ShowMyBadge and would like an inspector account, email licensing@showmybadge.com for more information. Are you approved by a state licensing board for issuing electronic badges? ShowMyBadge offers you the ability to provide an invaluable service to your customers while saving you time and money by eliminating the need to administer, print and distribute physical badges. ShowMyBadge helps you to establish a long lasting relationship with your customers and significantly increases the opportunity for repeat business when renewals come around. Printing and distributing physical badges requires a lot of logistics and expense. Just dealing with the required photos can be time consuming and frustrating. ShowMyBadge eliminates the need for printer supplies and card stock, mailings and address labels, and the inevitable reprinting of badges when packages are lost in transport.  ShowMyBadge provides you and your organization with a central database of all badges issued under your name as a provider. You will have access to all badges coming up for renewal allowing for targeted marketing for renewals, thus increasing your bottom line. When a license holder is found to be out of compliance, they shouldn’t have a badge with your name and number on it. ShowMyBadge offers the instant ability to deactivate badges whenever circumstances dictate, including everything from failure to complete renewal training to the discovery of criminal violations that invalidate their status. With ShowMyBadge, you have the ability to utilize the first state-approved, electronic badging system to augment your training and certification process. You benefit from a centralized database that instantly activates and deactivates badges in real time. Your customers benefit from immediate access to their legally required badges without the hassles of form submissions, photos and mailings. And you both will reap the benefits of eliminating costly paperwork, logistics and mailings that not only take time but also reduce your bottom line. If you would like to join the ShowMyBadge system and begin offering electronic badges to your customers, email sales@showmybadge.com for more information.